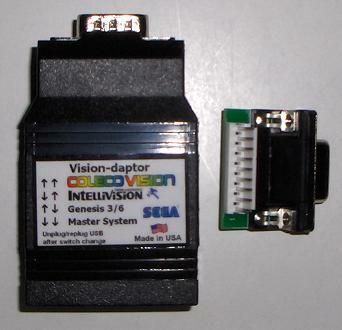 The Vision-daptor is a USB interface for connecting many digital controllers to your PC/Mac, Raspberry Pi, or game console that supports USB HID. No driver is needed as the Vision-daptor is recognized as a USB HID (Human Interface Device) joystick. No need to reprogram the firmware just to use a different controller. 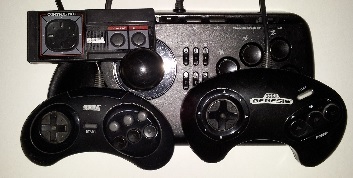 To use the auto-sense, press & hold "0" key on controllers with a keypad, else first (top/left) button (Sega Genesis: START, MSX/x68000: both buttons) immediately after the USB is connected. Continue holding until LED is flashing. Do nothing and it will default to the last used controller after 3 seconds. ** Raspberry Pi ** You can go into the RetroPie setup optional packages and install jzIntv and CoolCV. You can find controller mapping here (this for the Ultimate, but shares the same mapping). The mapping assumes the Vision-daptor will be the first joystcik (#0). 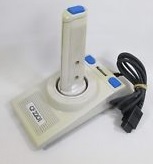 If you also have other joysticks/gamepads connected, then you may need to change the joystick # in the mapping. For jzIntv, you need to manually edit emulator.cfg - see bottom of page here. Firmware is upgradeable over the USB. Click here for more info on firmware versions and installing them. 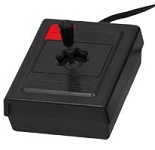 Mouse output is used for the Coleco SA spinner & Driving controller. There is a joystick mode that is like the Roller Controller joystick mode to use the Driving controller with emulators that don't support mouse input - active by holding the keypad * for a couple seconds while plugging in the USB. 3/18/13 - Note on Coleco SA spinner & Driving controller - only emulator I have found that can support these is MESS, but as of version 148b, has a bug that makes it erratic at fast speeds. Hopefully this will get fixed in a future version. 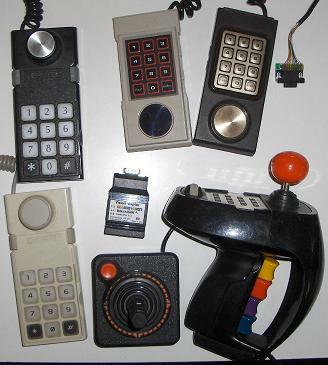 Be sure to also check out the Ultimate PC Interface for Intellivision that supports connecting two controllers, and also Intv ECS keyboard and music synthesizer, and Coleco Roller Controller. You can find set up instructions and hackfile for jzIntv on the Ultimate webpage, about 2/3's the way down. It shares the same mapping. 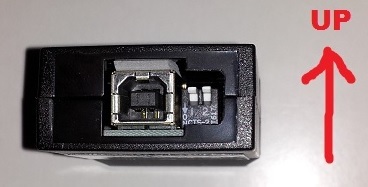 There have been a couple of cases of INTV-1 controllers having a different connector (middle pic below) that when installed on the dongle the order of the wires is backwards. These don't look like original connectors to me - I think they are replacements or part of an after-market replacement cord. To get around this, the key on the dongle can be easily pried off with a small screwdriver or tip of a knife blade. Alternate prying at each end, working it up a bit at a time. Once removed, you can then insert the connector on either way to then get the wires in the correct order. After changing switches between modes, the USB cable must be unplugged and replugged for it to take affect!